Lou is a thirteen year old girl living in Paris. She is an exceptional student with an IQ of 160 who is excelling in school. But Lou lives a lonely life with a mother who is suffering with depression and a father who is caught up taking care of her mother. She is a tiny girl, much shorter than her schoolmates who is neglected by her parents and forgotten about by her classmates. Her intelligence however affords her a freedom on a higher level and Delphine De Vigan uses this to narrate a story on homelessness set against the backdrop of one of the most grandiose and beautiful cities in the world-Paris. Tenderly written, Delphie De Vigan, tackles the issue of homelessness using the voice of Lou. It is a beautiful idea that such a little girl can take on the large problem of homelessness. Lou meets an older homeless girl called No with whom she strikes up a friendship with and eventually No comes to live with Lou and her parents. This book gives the reader philosophical insights into how society can continue to let people live on the streets and Lou’s innocence generates a powerful narrative. De Vigan tackles the issues head on and her language is simple. These two methods lend the novel a strong emotional foundation. 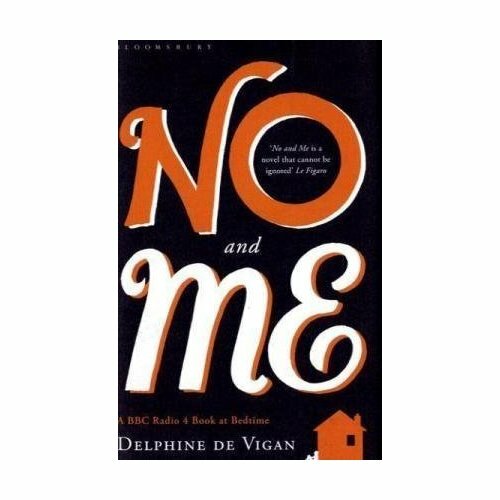 No and Me topped the bestseller charts in France where it was the bookseller choice in 2007. Bloomsbury is publishing it in two editions for adults and for teenagers. I didn’t know beginning the book that it was a crossover novel but it became clear very quickly. It is highly recommendable for young teenagers, a coming of age story and a good introduction to philosophy. An interesting read and a super translation from the original French story. Haiku; The French tradition, of teaching philosophy to children is here.